As every new mother knows nappy area requires care, attention and good hygiene practise. However even older kids can be prone to redness, so a good nappy cream always stays in mother’s rescue kit. I am happy to report that recently an award-winning British brand Childs Farm ( named after the founder’s Joanna Jensen farm )announced its latest addition to their wonderful range and their NEW Nappy Cream is not just 98% natural but also contains softening and hydrating shea and cocoa seed butters, as well as anti-inflammatory Aloe Vera which also helps to keep the skin well moisturised. 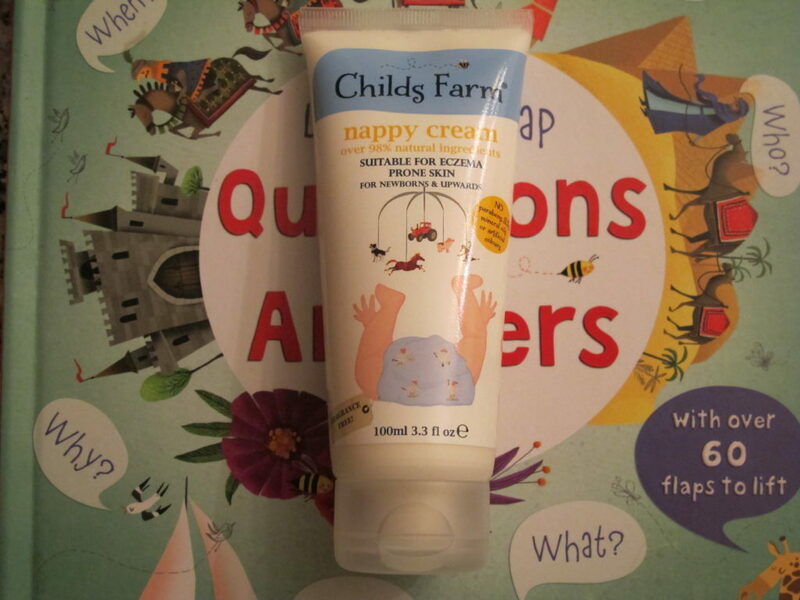 As with the entire Childs Farm collection, Nappy cream for happy bottoms is suitable from newborns upwards. The formula is mild, kind and safe for all skin types, including sensitive and eczema prone skin. In a recent independent user trial, 98%* of parents of babies with eczema said they would recommend Childs Farm to other parents with babies with eczema. Sadly eczema seems to be rearing up its dry head and more babies seem to be suffering from it ( according to the statistics kindly provided by Childs Farm team, 20% of under 5s in the UK now have atopic eczema and most often than not doctors prescribe steroids to treat this skin condition, instead of helping to manage it naturally ). The key to preventing sore bottoms and nappy rash is through cleanliness and moisturisation as nfection occur when skin is dehydrated and skin cells develop gaps between them, thus allowing germs to get underneath. I also appreciate not just the practicality of Childs Farm packaging but it’s visually enticing effect, as each product features characters from the NEW Childs Farm cartoon, which is now shown daily on the Cartoonito Channel on Sky. The whole approach is very appealing as Joanna, the founder of the brand, doesn’t just focus on her role and responsibilities for her own kids, she also makes sure she gets the message of the right type of skincare for women who might want to go for an easy option of buying let’s say Johnson’s Baby. While Childs Farm products are NOT fully organic but they are natural and do contain organic essential oils. I lost count of how many of my girlfriends and colleagues now rave about Childs Farm skincare ( CF products are perfect gifts, as well as party bag fillers ), praising it for the smell and efficacy. And it’s not just the mothers who adore the products, it’s the children themselves who are happy to use them during bath time. My kids always make sure I pack their favourites when we travel and if that is not the best advertisement for the brand, I don’t know what is. Now, let’s dig a little bit deeper on the subject of nappy rash, shall we? The outer layer of our skin is called the Epidermis, which makes new skin cells and protects everything beneath the surface of the skin from dehydration, stress and infection. The very top part of the epidermis – stratum corneaum – is in turn coated with a fine acid film (acid mantle) that is the first line of defense against viruses and other foreign invaders. Healthy skin cells are plump because they are full of water. Fats and oils produced by the skin help trap this water, maintaining body temperature and keeping good bacteria in and bad bacteria out. However we don’t develop sebaceous glands until adolescence (bringing the onset of spots) and it is this that produces the oily sebum that lubricates our skin. When skin is dehydrated the risk of infection increases, as the packed barrier diminishes and the bad germs can find a way to literally get under your skin. For the first month of their lives babies don’t have a protective acid mantel on their skin. This means that baby’s skin is much more liable to infection and needs to be kept clean. The most obvious place where infection is found is the dirtiest place on a baby and that is obviously his or hers nappy area. Water alone cannot do the job of cleaning insoluble pee and poo. The key is to cleanse whilst maintaining the skin’s slightly acid pH and to wash only when skin is dirty. bacteria thrives in a warm, cosy environment and literally gets underneath baby’s delicate skin. Did you know that a new baby’s nappy should be changed up to 12 times a day and older babies up to 8 times? I know I will probably come under the wrath of ecologists but I can give example of my own mother who used terrycloth ones when I was little ( Pampers didn’t exist then ) and even though they needed to be not just washed, but boiled as well, my mother changed me regularly thus instilling good habits in me, which I in turn do with my own children. You can wash your baby’s nappy area with clean, running water when at home but in my experience Childs Farm bath products do an equally good job, just don’t forget to do a final clean with just water. It is also beneficial to leave your baby without a nappy for a little bit of time daily, thus allowing the skin to breath and heal naturally. Ensure all of the bottom (but not the internal part ) are fully moisturised and allow the moisturiser time to be adsorbed into the skin. Remember: mositurised skin is plump skin, preventing bacteria from getting under the skin. Whenever possible, use a biodegradable nappy or reusable nappies. It is this generation of children that will be facing the consequences of our use of disposable nappies in their lifetime, so do your best. When selecting products to use on young skin always go for dermatological and pediatrician approved ranges: this means a skin doctor and a children’s doctor have reviewed the products through a clinical review. Clinical claims – meaning independent clinical trials of the products on subjects prone to the skin conditions made in the claims – allow the products to make claims on their labels to say they are suitable for newborn, sensitive or eczema prone skin. Mineral oils (petrochemical derivatives), SLSs, parabens or artificial colours in the products. Ingredients should be as highly natural as possible. Products will always include preservatives; once opened a product will be susceptible to air-born bacteria, so preservatives ensure that they can’t thrive in your tube of nappy cream. All Childs Farm products have been clinically trialled to ensure that they are suitable for newborns & eczema prone skin. They are dermatalogically and pediatrician tested and approved. The cream itself has a much lighter, more ‘breathable’ if you like, texture that moisturisers and nurtures the skin, rather than blocks its pores. It has a fairly neutral smell and that is my only minor criticism as I generally love distinctive smell of each of Childs Farm products. Having said that smell generally comes from parfum and al ingredients which nappy area doesn’t need – it needs to be nurtured and care for effectively to prevent discomfort for your child, whether he or she is newborn or an active school goer. All Childs Farm products contain natural & organic ingredients but AVOID parabens, mineral oils, artificial colours and SLSs.